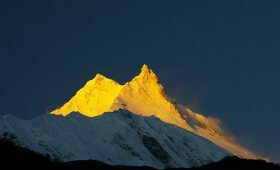 Nepal is popular for its mountains, natural beauty, and hospitality. Along with these, it is also one of the most affordable trekking destinations in the world. 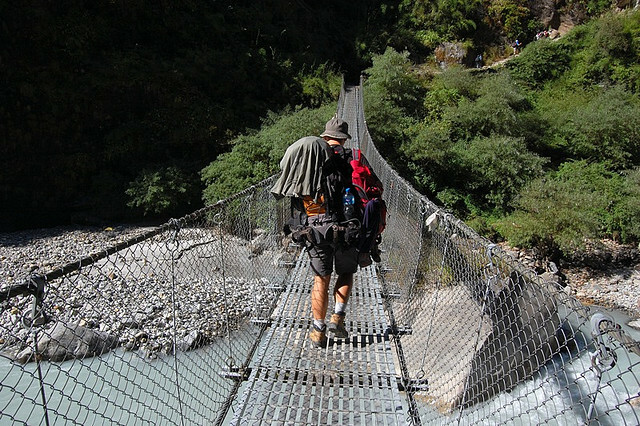 Nepal has a diverse range of trekking trails and destinations for you to choose from. There are short, day hikes to long duration treks. 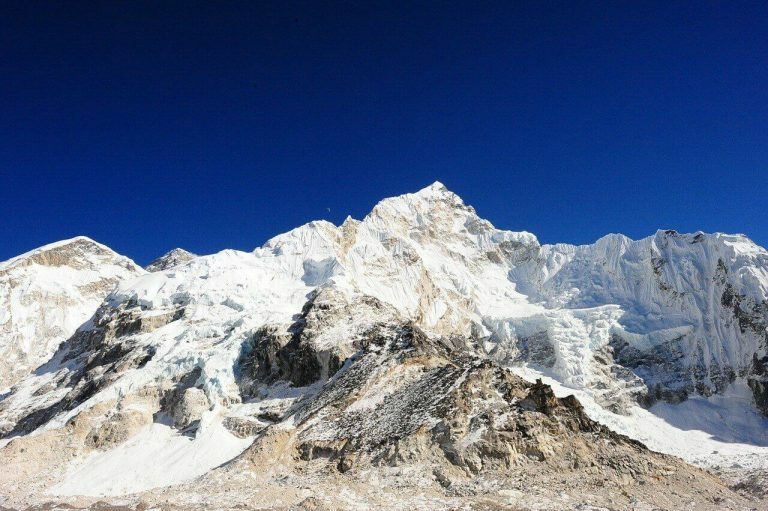 World-famous trekking destination the Everest and Annapurna region is in Nepal. A trek to Nepal in September offers a unique experience of trekking. September is a peak season to trek in Nepal. You have the opportunity to view some of the highest mountains in the world. 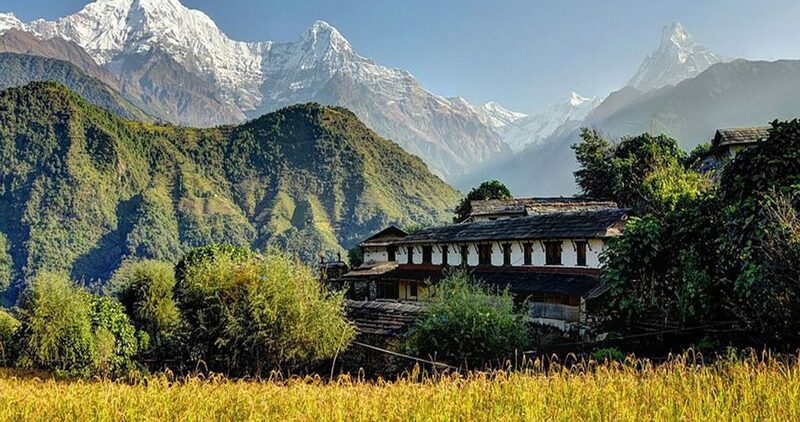 Along with this, you get to experience the diversity of natural and cultural beauty of Nepal. Trekking in Nepal in September is a lot fun and adds its own unique flavor to your trekking adventure in Nepal. With/ without a guide and porter? Nepal celebrates some of its biggest festivals in September like Teej. Make sure to inquire your agency about the dates of the festivals to enjoy the culture of Nepal in its full glory during these festivals. The forests and terrace farms are all vibrant after the monsoon making for great views. With the diverse range of landscape in Nepal, the weather conditions and temperatures vary from place to place. September is between two seasons- Summer(monsoon) and Autumn. Only Early September still sees slight rainfall the weather is quite pleasant thereon. September is the beginning of the peak(best) season to trek in Nepal. You should expect temperatures above 24 degrees Celsius on clear days. During the nights the temperatures drop to 11 degrees Celsius. 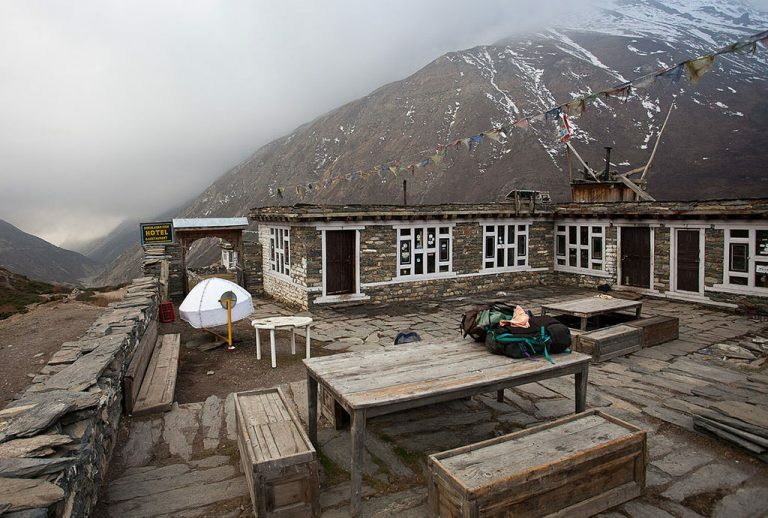 The weather and temperature get colder as you trek towards the higher regions of Nepal. All the trekking trails remain open in September. They are on offer during this month. Some of the most recommended trails are treks to Rara lake trek, Jomsom trek, treks to Upper Mustang, Manang. These areas lie in the rain-shadow area of Nepal and thus are not affected by rainfall. Treks to these regions are a unique experience. 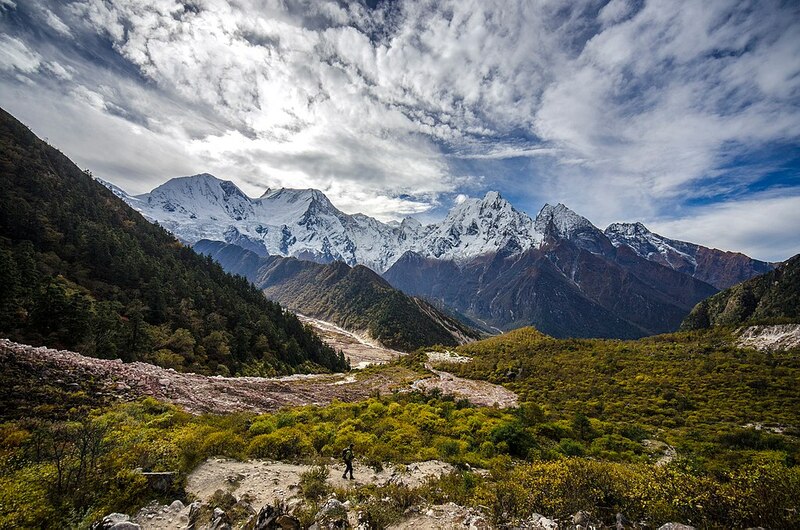 These trails give you a glimpse of a different Nepal. 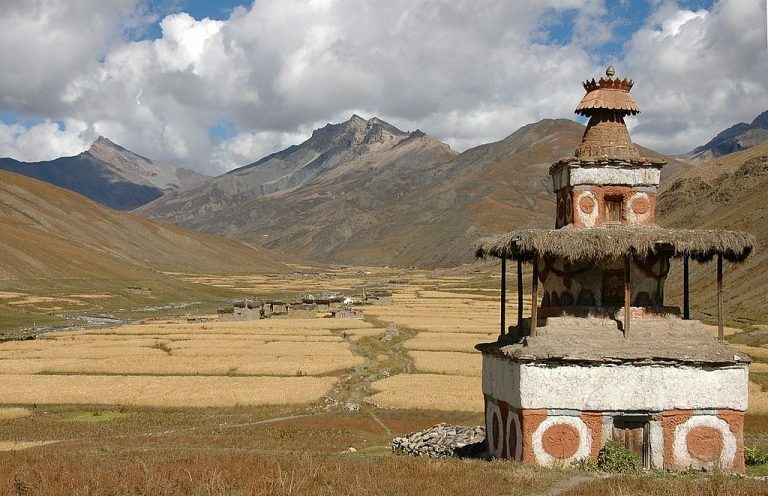 The Upper Mustang and Manang introduce you to dry, almost desert-like landscape of Nepal. The terrain is completely different. It is dry and barren. These regions have some of the oldest and the most unique rock painting, caves, and monasteries of Nepal. Some of the popular treks in Nepal are the Everest Base Camp trek, Annapurna Base Camp trek. The peak trekking season begins by mid-September, so remember to pre-book your hotels, packages, and flights. Nepal caters to both solo and group treks. There is a wide range of trekking destinations and routes to choose from for every kind of trekkers. 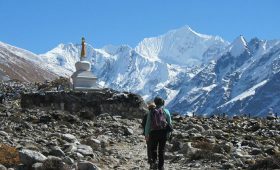 Nepal is suitable for solo, group, family, beginner, experienced level trekkers. There are some restricted regions to trek in Nepal that are the exceptions for solo treks, so be sure to inquire. It is always recommended to trek with at least a porter or a guide. It is good and safer to let someone, you trust, know about your daily whereabouts. Group treks in September and every other month is doable, cheaper and safer. For most of the popular trekking trails in Nepal, you have the option of going on treks with or without a guide and/or porter. Trekking with a guide and porter is always the safer option. The weather condition in the higher altitudes is quite unpredictable. Early September still experiences rainfall making for muddy trails. Hence, an experienced guide will come in handy. A proper guide can also provide you with in-depth information about the trails. They have good knowledge of the surrounding landmarks, mountain peaks, natural life, weather. A guide can also provide you with recommendations of the best trails to take, tea houses to stay at and the amount of time to rest during your daily treks. They can also be helpful to increase your interaction with the locals of the region. This way, you get an in-depth knowledge about the lifestyle, culture of the locals. You can still choose to do a solo trek to most of the popular trails in Nepal. During early September, you can trek to areas that are not affected by the monsoon. When getting a guide and porter, make sure you hire them from a licensed agency. It is recommended to check their credentials for your safety. All the tea houses and restaurants through the trail stay open during September. During the peak seasons you should pre-book your hotels, restaurants, trekking packages, flights. It is always safer and cheaper to book in advance. 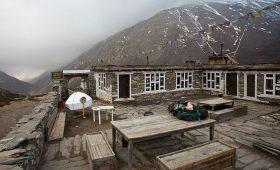 Almost all the tea houses, restaurants, cafes along the trails and the trekking destination will be open for business. There is less number of trekkers in early September, so you will not have to rush to get rooms and food. From mid-September, it may be crowded. The options for your meals and drinks are improving every year on the trails. However, for water, we recommend you to bring your own water purifiers to be safe from water contamination due to rain, flood, and landslide. Drinks are available throughout the trails through bottled water, hot water, soft drinks, tea, coffee and so on. Trekkers from all over the world need to get certain permits to trek in Nepal. TIMS (Trekkers Information Management System): This is compulsory for anyone wishing to trek in Nepal. Conservation Area Entry permit: This entry permit is required if your trekking route takes you through any conservation area. Restricted Region Area permit: This entry permit is required when you trek to the restricted regions of Nepal. Any or all of these permits are easily obtainable from Kathmandu. You also can obtain them at the trailheads: it may cost you more. You do get discounts for group permits. Anyone below the age of 10 doesn’t require any of these permits except TIMS. If you purchase a restricted area permit, you don’t require TIMS. There are checkpoints on the trekking trails where you will need to disclose these permits. You will have to pay fines if found without the right permits. You don’t need any kind of trekking experience to find a trekking route or destination suitable for you in Nepal. Any person who can walk uphill/downhill for 4/6 hours on a daily basis can do most of the treks in Nepal. We recommend you to prepare yourself both mentally and physically for any treks. Some of the difficult level treks do require some alpine trekking experience. However, most of the treks in Nepal are between easy to strenuous level trek. Trekking supplies and equipment can be easily purchased or rented from Kathmandu and Pokhara. However, you can choose to bring your own equipment and supplies. Below is a recommended list to help you with your packing requirements. You are free to adjust it according to your needs. September is a transitional month. Hence, you may need to make some additions to your regular trekking clothes. Make sure you bring a good rain/wind jacket, easy to dry socks, waterproof, ankle support hiking boots, backpack cover, waterproof pants. Throughout the year, it is also recommended to bring a pair of fleece pants, shirt, and jacket for the colder, wetter weather conditions. The weather is slightly less predictable in the higher altitudes. We recommend you to get a travel insurance that covers treks and travels to foreign places including emergency evacuation and rescue. Some trekking agencies do not accept trekkers without the right insurance. It is a safety precaution as accidents, injuries can and do happen even on the most well-maintained trails. You will need to get this from your home country. It is recommended to consult with your physician before embarking on any high altitude trek and take necessary medicines as precautions. Some trekking agencies have doctors who go along the treks with you, so consult and inform them of any complication you may have. Make yourself familiar with Altitude Sickness including its preventive measures, symptoms, and treatments. If you notice any of the symptoms, stop the trek immediately, take rest and start to descend. We strongly recommend not to ignore any of the symptoms of High altitude sickness during your trek. It is a matter of immediate concern and can happen to anyone regardless of their trekking experience. Do not skip your acclimatization days. Staying hydrated is the key to having a safe and comfortable trek. Detailed itineraries are available on our website for any of the trekking trails. These itineraries provide all the information you require about treks in Nepal- duration, distance, altitude, cost and so on. Do keep a day or two for flight delays and cancellations due to the weather conditions in early September. Pre-book your flights for mid to late September, it is the peak season and flights fill up more quickly. Trekking in Nepal is possible throughout the year. You only need the right preparation, equipment, gear, and motivation to have a successful and comfortable trek. Be sure to consider the weather conditions of the time you choose to trek. Prepare accordingly. September is a transitional month. You might experience different weather conditions on the same trail. Heading to and returning from your trekking destination. There is a range of tea houses available in the trails of Nepal. Book in advance to get the best deals on the tea houses, lodges, and packages. For any more information or queries, you may have for treks or tours in Nepal, feel free to contact us.